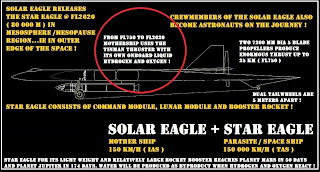 Sub-orbital altitude solar/rocket powered mother ship launch vehicle THE NORTH STAR: Hello everyone interested about a low cost orbital launch vehicle ! 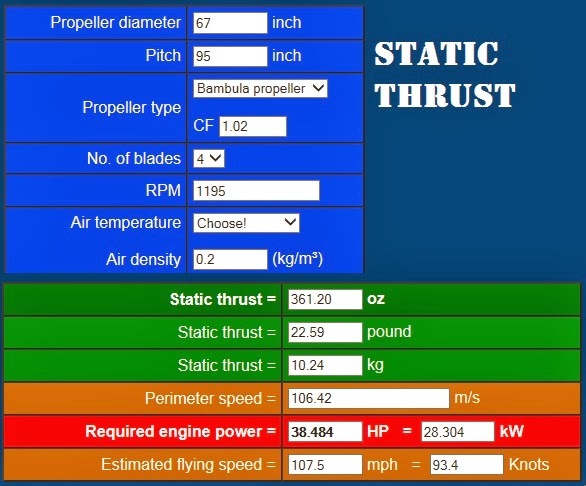 Hello everyone interested about a low cost orbital launch vehicle ! I just start by adding few drawings...since a drawing tells more than thousand words. Using ground effect on take off is one of the key issues in saving energy at take off. So ther is a 1/5 scale model and the actual 128 meters spanning ( yes it is huge ) Solar Eagle drawings mixed here displayed. See how high the Solar Eagle flies on solar power first...without using a drop of the fuel. Also Strato Launch Systems LaunchOne here compared ! 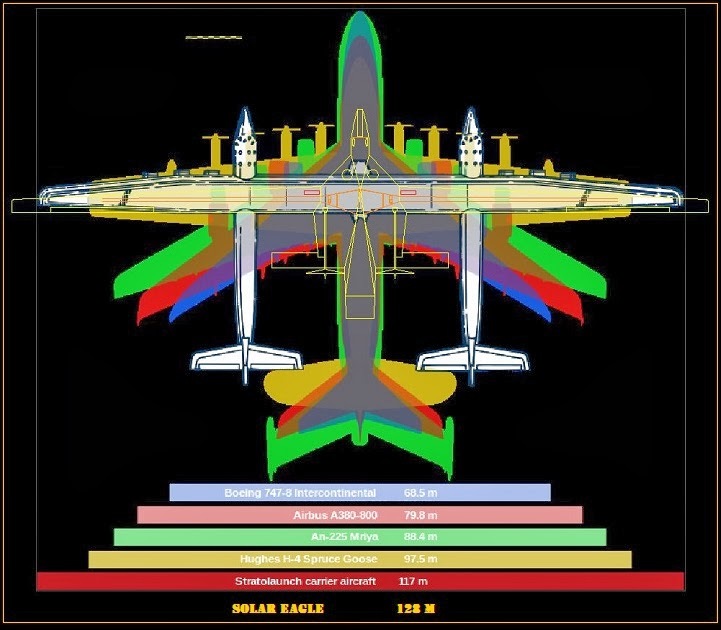 This is to show that at 15 km the Solar Eagle ( 1/6 scale model ) still beats the Solar Impulse power/thrust with a clear margin...and is climbing. One engine/prop below. 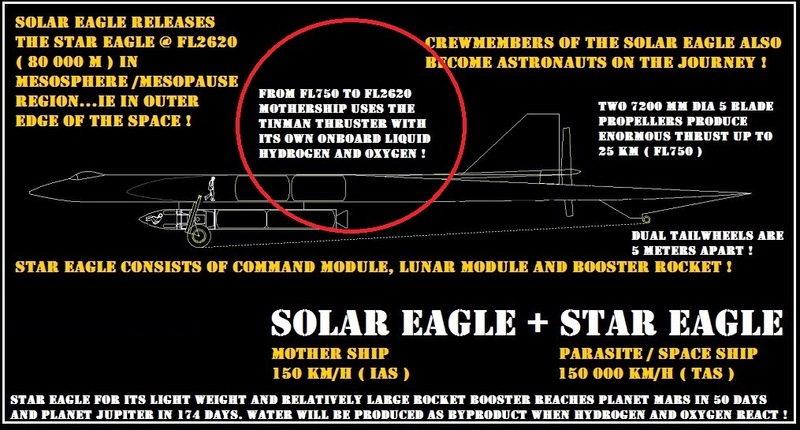 This is just my idea to use solar power to 25-30 km altitude and thereafter switch into rocket power...and fly up to 100-140 km altitude with 100 km/h IAS speed ( TAS 14 000 km/h ) and release the STAR EAGLE there. Solar Eagle glides to 40 km and there on flies with solar power back to the airfield. I hope I have cleared all possible aspects now...there are many of them. Main one being to use the parasites ( space rocket ) thruster in a climb to 120-140 km altitude using the onboard fuel. Thus no fuel of the Star Eagle will be used on the way up...until launched. I call this the second generation launch system..since it delivers the payload right into the orbit..or very near it. This might sound a bit exuberant, but actually I first discovered this mother ship / space rocked combo already in February 4th 2003.